With the help of new and renewed Members, the August Membership challenge was not only reached, but smashed! The initial goal was to reach 2500 active Members before the 1st September, but with your help, we were able to do even better and today sits at 2531 - a remarkable growth of 119 Members in just 25 days. (This is in addition to the 53,457 registered visitors). One of the most important changes to come from moving our shop processing out of our office to a warehouse is improved delivery services. We know you just want it FASTER, CHEAPER and with TRACKING. So, for the flat rate of $9.95 we can now deliver to anywhere in Australia by overnight air courier (Australian Air Express). Note: orders placed before 1pm EST (11am WST) Monday-Friday will be despatched same day; all orders after this time will be despatched the next business day. You can also rest assured that even though your order is now being packed outside our office, we still handle all enquiries directly and your calls and emails are only handled by our Product Sales Manager - Adele. Want more news? See the latest Shop Blog. 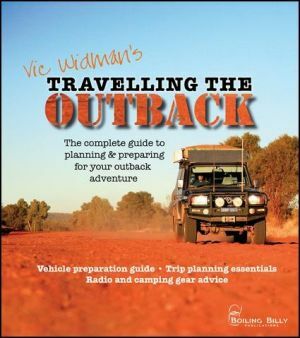 The newly released 2nd edition of the popular book Travelling the Outback, by Vic Widman contains all of the tips needed for a successful and enjoyable experience. Developed with the know-how learned from decades of first-hand experience as a tour operator and outback guide, this title has now been thoroughly updated to include all of the new developments in the 4WD and outback travel industry, including equipment, navigation, as well as vehicle use and setup. 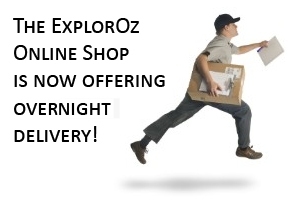 Get it today from the ExplorOz Online Shop. It's a seller's market ! The ExplorOz Trader is working so well, that items are being SOLD quicker than new listings appear. ExplorOz works because we have the best name in the industry for making a rapid turnover of your Caravan, Camper, Boat, Trailer, Fridge, Camp Gear, 4WD or Parts & Accessories. There's no mucking around with bids, registrations, or unnecessary complications. With Spring officially here, it's time to clean out the garage and shift what you no longer need. Why not take advantage of this seller's market and put money back in your pocket by placing a listing in the ExplorOz Trader. by purchasing a "Premium" Trader Listing, your advert is also featured through some of the most popular sections of the ExplorOz website, including the Forum. get the price right & put as much info and photos in your listing to make it easy for someone to say "I'll take it". Members - you can create a "Display" Listing free (1 per year). You can also pay using use any accured Member Money. One more sleep until Australia’s biggestNational 4x4 & Outdoors Show, Fishing and Boating Expo. Melbourne Showgrounds Starts tomorrow Friday 3rd until Sunday 5th September "Fathers Day" There’s way to much info to place in this newsletter so visit www.4x4show.com.au for all the latest information and special guests. SAVE SAVE SAVE Last chance for EXPLOROZ members to purchase discount tickets. Go to online tickets and type EXPLOR10 in code box. Kids under 15 are free, it’s the perfect place to take dad Fathers day weekend. Our newsletter is distributed to 41,298 subscribers on a fortnightly basis.